This card of two people looking into each other's eyes is one of the easiest to read - it is recognition of love, of a friend or a sympathetic soul. It might also be that kind of recognition of being drawn to a creative endeavor or spiritual path. Thus, the swelling of emotion within you is toward this person or thing. This happens all the time to us. We're at a party, feeling like we can't talk to anyone, sit down at the bar, meet the eyes of the person next to us and feel that they feel the same way. That we're "simpatico." Maybe we laugh or smile or exchange a few words. It is a moment of shared feeling, and it could lead to more if we want to invest more emotion into the relationship, if we feel that this might be for us. Or, as the night ends, we might just nod to the other person and go our separate way. A choice must be made of whether we will direct our new emotions toward them or not. 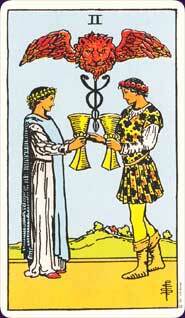 Learn the Two of Cups tarot card meaning and the rest of the card meanings, symbols and stories in our eBook.